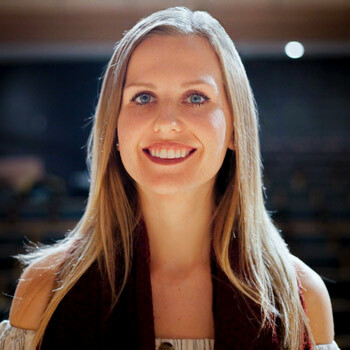 Wilfrid Laurier University music therapy student Olivia Maveal has been awarded the inaugural George Stroumboulopoulos Music Therapy Scholarship, funded by the media personality through the Canadian Music Therapy Trust Fund. Maveal, who studied community music for two years before joining Laurier’s music therapy program in September, plans to use the $4,000 scholarship to purchase instruments for use in her practice, as well as to help fund her education. After she finishes her bachelor’s degree, Maveal hopes to earn a Master of Social Work degree and psychotherapy accreditation. Undergraduate and graduate music therapy students from across the country applied for the scholarship. Maveal was chosen for her passion and hard work. “Something about Olivia’s application had us all – myself, past-chair Wanda Gascho-White and George Stroumboulopoulos – in agreement,” says Regan Harney, who works in fundraising and community development with the Canadian Music Therapy Trust Fund. “It was impossible to not feel her motivation and determination to work in and better the field of music therapy. Since she started at Laurier, Maveal has brought music to retirement homes, singing for the elderly at dinner time, and to a women’s shelter, encouraging women to write songs, collaborate and build a sense of community. She also worked for two years as a volunteer coordinator with the Music Therapy Association of Ontario. Maveal is currently president of Laurier’s Music Therapy Student Association, which hosts educational, awareness-building and fundraising events throughout the year, and is completing a placement at a seniors’ home in Waterloo Region. The scholarship was funded by and named after George Stroumboulopoulos, a Canadian media personality known for his work on radio and television, including as a MuchMusic VJ, the host of CBC’s The Hour, later George Stroumboulopoulos Tonight, and host of Hockey Night in Canada. Stroumboulopoulos has been the host of The Strombo Show, now on CBC Radio 2, since 2005.